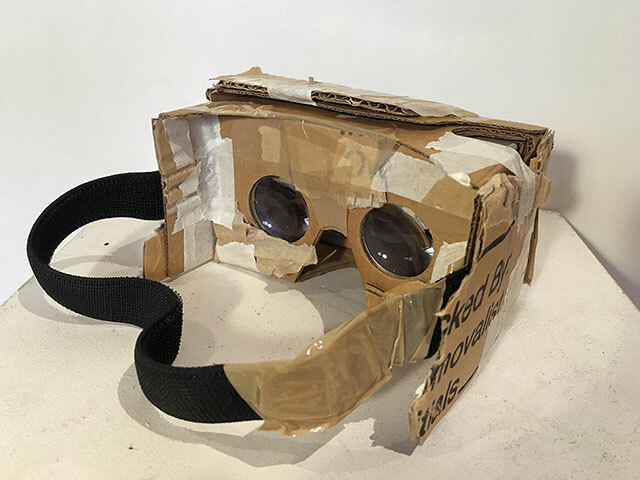 Virtual Reality is imbued with a heighted and improved ocular vision, my low fi version of Google’s Cardboard VR is just the opposite: A hopelessly low-fi VR world made of cardboard and packing tape. It’s an incredibly disappointing and pathetic experience and offers a corrective to the shamelessly utopian ideal of real VR. The idea of Google and cardboard combines the high tech with the low tech; cardboard as a material almost appears at the opposite end of the material hierarchy to technology, VDR extends this low grade material into a failed cardboard VR world.